DEALS EXPIRED: For a limited time only, B&H Photo is taking $400 to $600 off loaded Mid 2018 15-inch MacBook Pros exclusively for AppleInsider readers. Prices start at $2,799 for 1TB models that also feature an upgraded 2.6GHz processor and Radeon Pro 560X graphics. Need even more storage? Upgrade to the robust 2.6GHz, 32GB, 2TB, Radeon Pro 560X config and save $600. These deals provide shoppers with the lowest prices available by $350 to $500, according to our 2018 15-inch MacBook Pro Price Guide. To activate the limited-time offers, please follow the step-by-step instructions below from a laptop, desktop or iPad. Deals expire on Jan. 30. 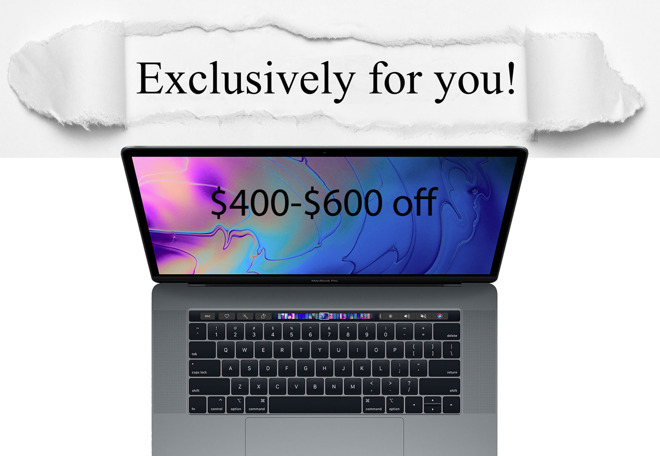 Instructions: To redeem the discounts, simply click through the exclusive pricing links above using AppleInsider's desktop site and look for the advertised offers. You can easily tack on an AppleCare extended protection plan to these MacBook Pros for $379 by selecting the AppleCare option immediately after you press the "Add to Cart" button on B&H's website.